The story of the 7th Maine Regiment is typical of the many gripping narratives that illuminate the pivotal Battle of Antietam. In the late afternoon of September 17, 1862 the 7th Maine Regiment received new orders. 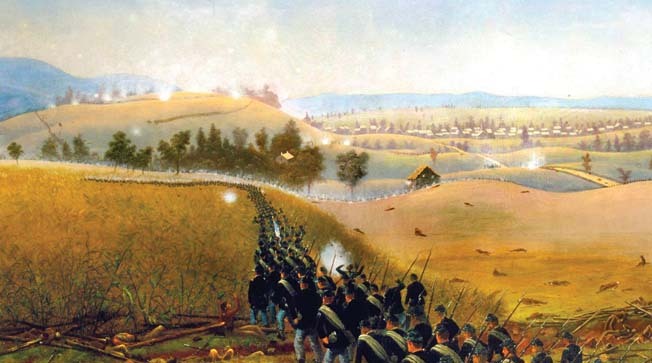 The Battle of Antietam had raged throughout the day. Thousands were dead and even more lay wounded on the field or suffering in hospitals behind the lines. After horrible combat at places known afterward as The Cornfield and Bloody Lane, the fighting climaxed at the lower bridge over Antietam Creek that historians called Burnside’s Bridge in memory of Maj. Gen. Ambrose Burnside who failed to capture it in a timely fashion. The 7th Maine was about to enter this action and its place in the history of the American Civil War. Twenty-one year-old Major Thomas Hyde, a native of Bath, Maine, commanded the regiment. The regiment was part of Colonel William H. Irwin’s brigade of Maj. Gen. William Franklin’s VI Corps. The unit was seriously understrength that day. Only 181 men remained of its original complement of 1,000. Hyde’s regiment had gone into action at the Bloody Lane and then taken up a position behind limestone outcroppings on the rolling hills west of Antietam Creek that afforded it a measure of protection from enemy fire. In that location the men dodged desultory enemy fire. When they could, the regi-ment’s marksmen sniped at enemy artillerists and officers. Hyde and his men expected that when night arrived they would be relieved; however, like other regiments they lacked knowledge of how the battle was progressing. Irwin eventually issued new orders to Hyde. He told the major to lead his regiment in an attack against the Piper Farm where Lt. Gen. James Longstreet and Maj. Gen. Daniel Harvey Hill had cobbled together infantry regiments and batteries for a final stand following the Confederate retreat from the Bloody Lane. Hyde believed the order was foolish. He told Irwin that an unsupported attack against such a position was tantamount to suicide. He felt a personal responsibility for his men and was unwilling to lead them in such a perilous attack. Irwin repeated his orders and then asked an insulting question meant to goad Hyde into leading the attack. “Are you afraid to go, sir?” asked Irwin. Hyde wanted the men of the regiment to know that it was Irwin’s idea and not his own. “Give the order so the regiment can hear it, and we are ready, sir,” Hyde said. The 7th Maine obeyed its orders and advanced toward the farm. Waiting to receive their attack were the remnants of four Confederate brigades from Hill’s division and Maj. Gen. Richard Anderson’s division. The Rebels poured a deadly fire into the small group of Union soldiers. The Maine men found themselves trapped in farmer Henry Piper’s sprawling apple orchard. The repulse of Hyde’s regiment was over quickly. The survivors limped back to their previous position. Of the 181 men who participated in the attack, 12 were killed, 63 wounded, and 20 reported missing. Of the wounded, 13 succumbed to their wounds. They later learned that Colonel Irwin had been drunk when he sent them forward in such senseless slaughter. The Battle of Antietam is full of such small stories, tales that combine to reveal the horror of one of the Civil War’s worst days. Antietam is remembered as the bloodiest day in American military history. Union casualties numbered 12,400 men, and Confederates casualties amounted to 10,320. The Union Army won a strategic victory for it repulsed General Robert E. Lee’s first invasion of the North, forcing him to retreat shortly afterward to Virginia. But that victory had a high cost. 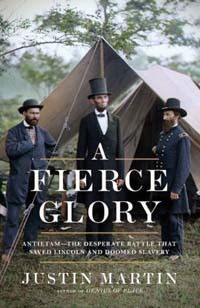 The story of this dreadful battle is told in detail in A Fierce Glory: Antietam—The Desperate Battle That Saved Lincoln and Doomed Slavery (Justin Martin, Da Capo Press, Boston, MA, 2018, 336 pp., maps, photographs, notes, bibliography, index, $28.00, hardcover). Although there are many books on the Battle of Antietam, this one stands out for its superb use of first-hand participant accounts. The author weaves the broader story of the battle into the work in a seamless manner. He also describes the role of famous noncombatants associated with the battle, such as nurse Clara Barton and photographer Alexander Gardner. In addition, the far-ranging consequences of the battle are discussed at length. The result is a work that engages readers and retains their interest page after page. The book includes a useful section for visitors to the battlefield park, helping them understand the terrain in relation to the action. For these reasons, the book is a worthy addition to the works available on Antietam and the American Civil War. 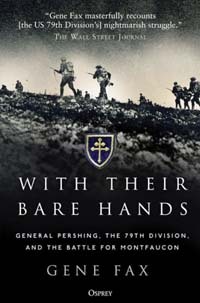 “The infantry of the 79th Division attempted to capture the German positions with their bare hands,” wrote Colonel C.F. Crain of the American 79th Division after his unit attacked the enemy at Montfaucon. The engagement was the most important of the battles of the Meuse-Argonne Offensive of 1918, part of a series of Allied attacks known as the Hundred Days Offensive. The 79th Division’s men were novice soldiers. The unit was composed of draftees from Philadelphia, Boston, and Washington D.C. They had only been in combat for seven weeks when the attack on Montfaucon was ordered. The author’s grandfather fought in the battle and this work is the result of 17 years of research into the action. It uses the letters and memoirs of the participants as well as official reports to convey the action in descriptive prose. This work also analyzes the decisions and orders of the senior American leadership, including General John Pershing, who hoped to strike a decisive blow with the risky attack. The book is an in-depth look at a single division in a single battle, fighting a difficult action with little support. In early 1971 the war in Vietnam began to focus on the Ho Chi Minh Trail, the North Vietnamese logistics line that went through Laos and Cambodia. Seventh Air Force commander, General Lucius Clay, recalled the instructions he received from his commander, General Creighton Abrams: “He wants that Ho Chi Minh Trail in such a shape that a crow has to carry his rations to fly over it.” Observation and air strikes began soon after, and a South Vietnamese-led ground operation was planned, Operation Lam Son 719. It was hoped if they could wreck the enemy’s supply lines it would give them a year’s breathing space, during which time South Vietnam could recover and strengthen. North Vietnamese intelligence got wind of the plan, which the Americans knew, but chose to go ahead with the operation anyway. While the first days of the attack went well, massing NVA forces soon drove the South Vietnamese back across the border in defeat. The Vietnam War is widely considered an American defeat and a tragedy of bad decisions and poor strategy. The author of this excellent new work touches on these issues, along with American successes. His real argument focuses on how the war, despite heavy American casualties, was only a setback for them, whereas it was an absolute disaster for the Vietnamese people as a whole. Forty Vietnamese died for every American killed, atrocities were committed by both sides, and the entire nation sank into oppression after the North’s victory. It is estimated between 400 and 1,000 women surreptitiously served in military units as soldiers during the American Civil War. They frequently did so for the pay and to escape poverty at home. At the time women might make only $4 a month working in a Northern factory while a private soldier in the Union Army made $13 monthly plus rations. There were other reasons as well. Mary Ann Clark of Kentucky enlisted to get away from an abusive husband. Harriett Merrill wanted to escape a life of prostitution. Sarah Wakeman even wrote to her family and told them she enjoyed her new life and freedom, boasting she had plenty of money and had a good time soldiering. Former slave Maria Lewis joined the 8th New York Cavalry when it appeared in her town, disguising herself as a “deeply tanned” white male. Initially intending to use her enlistment as a way to go North, she chose to stay with the Union Army another 18 months and was later chosen to join an honor guard presenting captured flags to the Secretary of War. These are just a few of the stories of women serving their countries during the Civil War. This new work delves into the details of their lives and service as well as the risks they took. The book also covers women who served openly in the medical services and those who acted as spies. It is quick to read and very engaging. The service of women during the conflict has always been known, but this book brings together many stories to reveal how wide female involvement in the war really was. Between the fall of the Western Roman Empire during the 5th century and the Arab conquests of the 7th century, there was a time when the Mediterranean basin was dominated by Emperor Justinian, ruler of the Eastern Roman Empire. Centered on Constantinople, this polity sought to reclaim what was lost—vast lands controlled by a number of foreign powers. Despite upheavals in the Christian world and the spread of a plague that may have rivalled the Black Death, Justinian unleashed his armies in an onslaught against his various foes. Though his efforts would fail to recreate the dead Roman Empire, his actions had far-reaching consequences for the region and history. Justinian is often referred to as the last Roman and there is justification for this viewpoint. This is the newest addition to Oxford’s acclaimed Ancient Warfare and Civilization series, and the author does excellent work in guiding the reader through Justinian’s recovery of the Eastern Empire and its importance to history. It combines archaeological evidence with contemporary source material to provide a thorough and balanced view of the topic. The book also gives attention to Justinian’s enemies, such as the Persians and Vandals. It is also well-illustrated and contains a set of maps to guide the reader around the region as events occur. It is eminently readable. The Battle of Belleau Wood was a defining moment in the modern history of the United States Marine Corps. 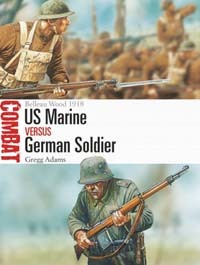 The 4th Marine Brigade went into action at Belleau Wood in June 1918 and fought elements of three different battle-hardened German infantry divisions. The fighting was difficult and costly but the Marines fought with a tenacity that earned them the nickname Devil Dogs from their opponents, a sobriquet still used today. The success of the Marines had a positive effect on French morale. Fears of a German advance on Paris were replaced by headlines of U.S. Marines attacking the enemy. The presence and success of the Americans likewise had a negative effect on German confidence as they realized the balance was turning inexorably against them after four years of war. This study compares the U.S. Marine infantryman to his opponent, the German foot soldier. The book begins with a look at how each side trained, armed, and equipped their troops as well as looking at their leadership, morale, and logistics. The author then chooses three different engagements of the Belleau Wood fighting to highlight the battlefield performance of the two forces. The work ends with an analysis and overview of the aftermath and importance of the battle. It is well illustrated and features both period photographs and original artwork. Brent Dulak was a newly promoted sergeant and U.S. Army medic when he was sent to Afghanistan. Already a veteran of two tours in Iraq, Brent was showing signs of fatigue and stress. 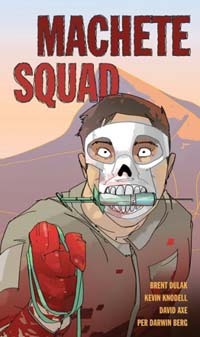 He had to lead a team of medics in a remote region of Kandahar Province as American troops prepared to turn the region over to the local Afghan forces. Brent had to try and keep his team alive and able to do their job, treating the wounded while surrounded by Taliban insurgents, local allies who did not seem to actually be allied, and civilians just trying to survive the constant warfare, mines, and bomb blasts. As the wars in Iraq and Afghanistan grow old enough to become part of history rather than simply current events, the veterans of those conflicts are beginning to tell their stories. Many of those who served are of a younger generation, raised on visual media along with the traditional printed books and articles older readers often prefer. This graphic memoir is part of a new series by the Naval Institute Press aimed at helping these veterans tell their story in a visual way that reaches out to younger readers. This work is open and honest about soldiers’ experiences and is often darkly humorous in a way that veterans of any era will find familiar. James Ewell Brown “Jeb” Stuart was considered the Confederacy’s most dashing and daring cavalry commander of the American Civil War. He was almost the stereotype of the Southern gentleman of the era. When not fighting, the nattily attired cavalier attended balls and galas and even recited poetry. Said to be the only one who could make the taciturn Lt. Gen. Thomas J “Stonewall” Jackson laugh, he performed superbly as a commander and scout for General Robert E. Lee. Stuart proved this in dozens of raids and battles during the year preceding the Battle of Gettysburg, when the Army of Northern Virginia was turned back in its second and final invasion of the North. 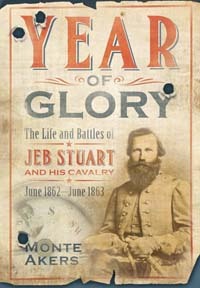 The focus of the book is the period from June 1862 to June 1863, when Stuart made his reputation. It follows him on an almost daily journey as he garnered one success after another. The author takes Stuart’s own letters and reports and combines them with firsthand accounts by the men who rode with and largely worshipped him. The book is a well-written snapshot of Stuart at his best when fortune seemed with him and his cause. 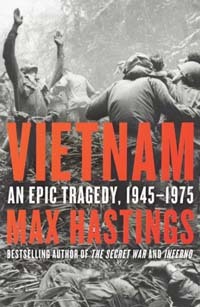 Tags 1945-1975, antietam, Book Reviews, Jeb Stuart, Justin Martin, Max Hastings, Military Heritage January 2019, Vietnam: An Epic Tragedy, Women of the Blue and Gray.